The relationship between pilots and air traffic control personnel has never been cavalier. There is an invisible wall that exists – the disembodied voice that carries instructions phrased in officially sanctioned terminology is both reassuringly familiar and yet remote and impersonal. Air Traffic Controllers are distant authoritative “Gods”, heard but never seen, whose main purpose in life is to keep pilots from killing themselves and others by telling them where to go. Behind that confident decisive voice we hear on the radios are men and women who come through some intense training in order to get a job that pays well and commands respect. At this time the only real information the pilot has about air traffic comes in the form of government directives and orders, written in stilted language that tells the pilot what he has to do, but not why. They do not tell the pilot how their actions are welded into a pattern that affects all the other pilots. An Air Traffic Control specialist for over 33 years, first with the Federal Government and later with Lockheed Martin, Rose Marie Kern has written articles for 17 different aviation magazines and newsletters and is a popular speaker for pilot associations in the southwest. The book she is writing, Air to Ground, gives pilots a glimpse into the cold corridors of Air Traffic, and allows them insights into the people who work in an environment so critical to their own. Air to Ground contains current and historical data on the National Airspace System, the Air Traffic Control System, and aviation weather in a way that is friendly, easily readable and understandable to even the most novice pilot. It is not meant to replace the government’s directives, but to supplement them. Although there are a few books that talk about Air Traffic on the market, no other book approaches the pilot from this perspective, it fills a vacancy long overlooked. Intermingled with the technical information are stories and snippets of humor collected over the last 33 years. These little bits exemplify what happens in the Air Traffic workplace when the microphone is not keyed, humanizing the disembodied voices the pilots hear. “Air to Ground” is a phrase used to describe the frequencies used by the pilots when they speak to Air Traffic. 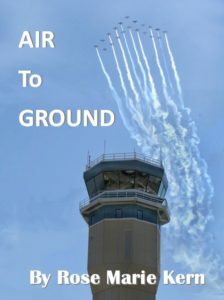 The book, Air to Ground, appeals to pilots, airport managers and the air traffic personnel who work in the U.S. and will greatly enhance the pilot’s understanding of the National Airspace System, its procedures, and the people whose job it is to provide for the safe and efficient flow of Air Traffic. NOTE: 10% of all Air to Ground Sales is donated to the EAA’s Young Eagles Program. 57 Chapter 9 – Do You Want Just “Any Briefer”? 147 Do You Need to File a NOTAM? 176 Where the Heck is my Flight Plan? 238 Hey There…It’s My Turn! 266 What is VFR Flight Following? 276 IFR Clearance Limits – questions from pilots. 281 What is a Special VFR Clearance? 283 Airplane 54-Where are you? 295 Where Does it Say I Can’t Fly There?